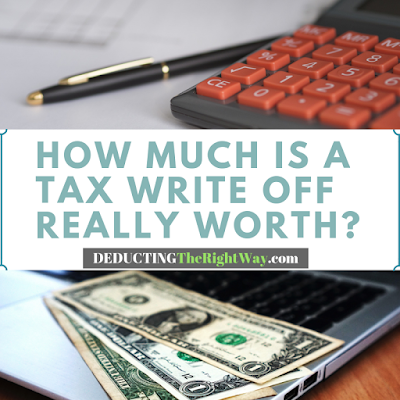 What is a Tax Write-Off Really Worth To Me? Find out how to compute the overall effect of a business expense without using a complex tax calculator. Small business owners are often under the wrong impression about how their spending affects their final tax bill. When you pay for a business expense, it's not a dollar-for-dollar tax reduction. When you pay for a business expense, it's not a dollar-for-dollar tax reduction. Example: Let's assume you typically owe $5k in taxes every year. You spend $1k on marketing. The $1k does not reduce your final tax bill by the same dollar amount. Remember, this is a very rough estimate but a good indicator of what you can expect. Example: Based on our previous fact pattern, the $1k marketing expense would help reduce your final tax bill by approximately $240 which means you would have a $4,760 tax bill. TIP: An expense has to be large for it to reduce your tax bill dramatically. Check out our other article 5 Tax Deductions Every Freelancer Should Know.